This charity single featured a choice selection of tracks from The Lord Of The Wing, a documentary about Celtic football legend Jimmy Johnstone. All proceeds went to: The Jimmy Johnstone MND Tribute Fund, Motor Neurone Disease Association, Radio Lollipop International and The Children's Hospice Assocation. The Bhoys From Paradise was the name given to the collective of artists featured on the CD: Dirty Old Town was by Simple Minds and Jimmy Johnstone, Road To Paradise was by Shane MacGowan featuring The Kick Horns and Lord Of The Wing was by John McLaughlin. 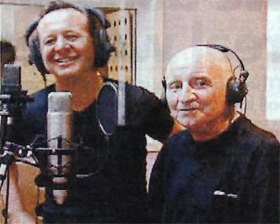 Recorded during rehearsals for the Alive And Kicking 2003 tour, the version of Dirty Old Town on the single featured Jim and Jimmy sharing vocals. A reference CD produced that June 2003, features three different mixes of the song. A promotional CD featured Shane MacGowan's Road To Paradise as the title track. This was the first release and issued in a limited number. The second promotional CD has the same running order as the commercial single, and it was this pressing which was sent out to the record stations and press. All the artists involved offered their services for free to raise awareness of Motor Neurone Disease. A video of the recording involving Jim, Charlie and Jimmy can he found here.